I love that this Keurig makes coffee,tea and etc to your tastes,if you like it light,mild or very strong this is the machine to do it for you. 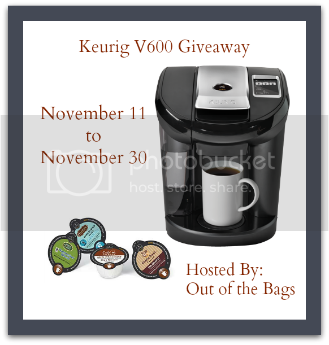 The Keurig Vue V600 Brewing System lets you customize your own cup of coffee, tea and more. Brew stronger, bigger, hotter and with more choices than ever before. The V600 has a black and white touch screen and Custom Brew Technology Vue which makes sure that your beverages are brewed to your liking, giving you great results every cup and every time. And your choices are nearly limitless. In addition to coffee, tea, hot cocoa and iced beverages, Vue brews delicious café and specialty beverages as well. You can make a cup of joe for your Dad and then make a cup of tea for your Mum and if the kiddies want some hot chocolate you can do that too. It is really versatile and a great addition to the kitchen. Disclosure: Stephanies-Bit-By-Bit is not responsible for prize fulfillment. My opinions are 100% my own and may differ from your own or even those stated in this post. Out of the Bags is responsible for prize delivery.